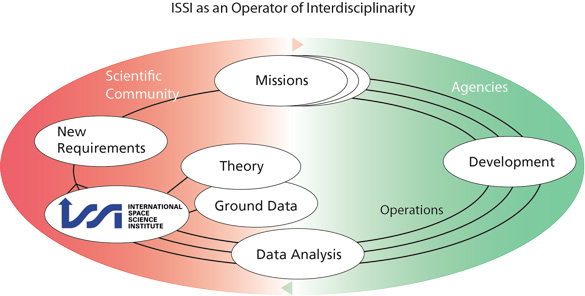 The International Space Science Institute (ISSI) is an Institute of Advanced Study where scientists from all over the world meet in a multi- and interdisciplinary setting to reach out for new scientific horizons. The main function is to contribute to the achievement of a deeper understanding of the results from different space missions, ground based observations and laboratory experiments, and adding value to those results through multidisciplinary research in the framework of International Teams, Workshops, Working Groups, Forums or as individual Visiting Scientists. The program of ISSI covers a wide spectrum of disciplines including the physics of the solar system and planetary sciences to astrophysics and cosmology, and from Earth sciences to astrobiology.